Will I be able to complete the BB-8 event? Hey y’all, I was curious if my FO squad would be enough to complete the B.B.-8 event coming up. I have not optimized my mods at all, but wanted to know if having ~3 top heavy units and two that are only 7*, undergeared will be enough. I do not want to waste another Zeta on my FO squad so OG Kylo’s Zeta is out of the picture. Here is the link to my SWGOH.gg if that helps. If this is not enough, what is the bare minimum to scrape by? Hmmm I would say you have some chance, kylo ren has been known to carry the entire team if he's with zeta and gear 12. I would say give kylo unmasked speed mods so he can stun taunt bb8 and constantly attack people with debuff to keep it. Use phasma and the officer to buff first order executioner so he takes more turns and can use his special. I don't quite remember their team since it's been a while. Kill bb8, rey, then finn. Do your best to use regular kylo ren's stun ability on chewbacca to prevent him from dispelling and stunning kylo unmasked. If kylo unmasked does not have taunt try to use first order officer or phasma to boost him so he can regain. You want to try and kill chewbacca before han since chewie scales damage off of how many turns pass before his. Good luck. Get Kylo and FOO to G8 and you'll be fine. As is, you're borderline. 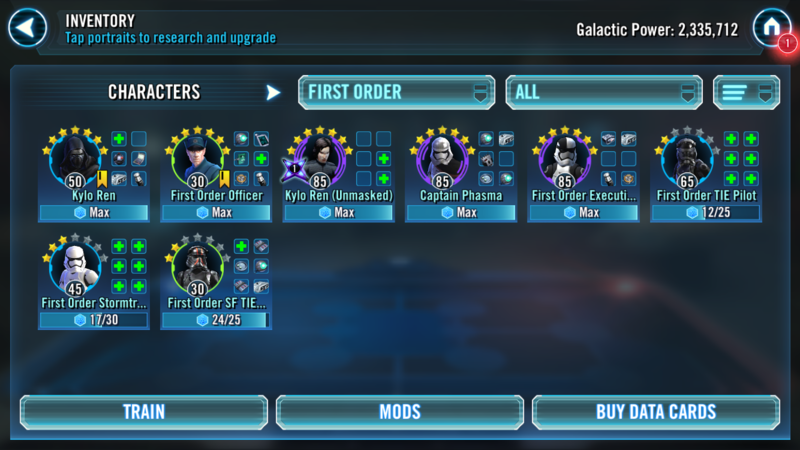 My OG Kylo did it by himself (literally, everyone else died very quick in the beginning) at g9, no zeta. Gear panda, but Kru and kylo masked will carry you easily... (i did it without z, with officer level 72 g8 no mod and phasma level 66 g7no mod, kru well modded g9 kylo well modded and i used the pilot g10 with not so good mod... if you gear to 9 the panda and you give him a lot of health and critic damage, you will win this easily. At level 30 gear 3, your Officer is going to go down quick, and Kylo will follow shortly after. That leaves KRU, Ex, and Phasma. Phasma isn’t going to do tons of damage, and KRU is a tank, so essentially your Executioner is going to be doing most of the damage. It’s probably doable, given KRU is gear 11 with the zeta and will be taking most of the hits. But I’d gear Officer and Kylo up a bit anyway. They’re pretty easy to gear up to 8, and they’re both useful for future uses in territory battles, territory wars, and raids. UPDATE: This team was easily able to 7* the BB-8 event! Thank you all very much for the help and advice! Not bad for only being lvl 79! Can I get BB8 with this squad? Side note - I just learned that Advantage is crit on next hit so I will be switching all my triangles to + crit damage.mods to increase damage output.